Why JING!, What We Teach., F.A.Q. Jing Jing Evans, a San Diego resident, has won about 70 medals, over 46 of them are Gold. She is the second lady (next to her mother) in the USA taiji history to win the most medals and has received the highest honor in just a few years. She was trained in Beijing at 14 while she was studying Chinese there. Later on she learns taiji from her mother and Wushu from Grand Master Chen Daoyun. Jing Jing was invited to perform in Masters' Demo in major tournaments. If she is not competing, she will then serve as a taiji judge since early 2003. People in the USA Taiji Field awarded her the title of "Princess of Taiji", because, like her mother, she practices all the 4 major taiji styles (Yang, Chen, Wu and Sun styles), and all the other standardized competition routines. In addition to her taiji achievement, you will find her other amazing story below. In China, the arts are divided between “wen”, defined as the literary arts, and “wu” or the martial arts. There are rare individuals who are said to be “wenwu shuangquan”, or accomplished in both non-martial and martial arts. Then there is Lui Guojing Evans, or Jing Jing, as she is called. She competes in “wushu”, or Chinese martial arts. In July 2003, she was in Annandale, Virginia, to compete in the tournament sponsored by the USA Wushu-Kungfu Federation. She came home with 6 gold and 2 silver medals, adding to her career total of 45 gold and many silver and bronze medals in two weapons (sword and fan), and 4 distinctly different styles of T’ai-Chi (transliterated as taiji in the pinyin system that is in current usage). She was named Grand Champion of the competition, the 8th grand championship that she has won. 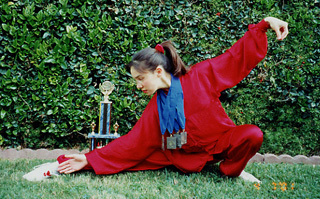 In 2001, the USA Wushu-Kungfu Federation awarded Jing Jing the title of “Internal (taiji) Athlete of the Year”. The martial arts being categorized into soft, internal forms like t’ai chi or hard, external forms like Shaolin Kungfu. Jing Jing has taught or is teaching t’ai chi at UCSD, Southwestern College, USD, SDSU, the San Diego Taiji & Qigong Association, and the JING Institute of Chinese Martial Arts & Culture where she also serves as president. She worked for two years as a lab technician at the VA Medical Center and UCSD, and taught English for a year in Beijing and a half-year in Tokyo. She was a Chinese-English translator for a Chinese magazine, a Shanghai movie and TV company , and the US Navy. She speaks English, Mandarin and Cantonese fluently, and has written a Chinese English glossary of martial art terms. 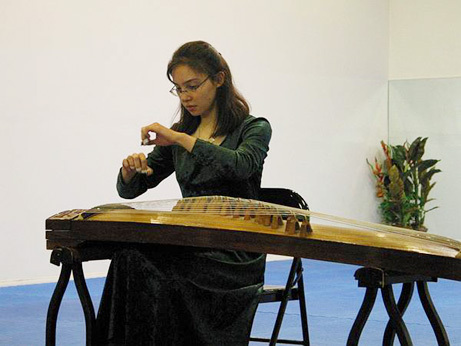 She is a performance artist on the guzheng or ancient Chinese zither. She is a full-time graduate student in the cognitive science department at UCSD. And she is 23 years old. Try skipping 3rd and 4th grades, and going on to college after 8th grade. Take another 2-years off, live in Beijing and Tokyo to focus on language and music studies, and graduate from UCSD at 17. Work, study, learn t’ai chi to competition level. Or, as Jing Jing suggests, “Have a good mama.” Mama is Siu-Fong Evans, professor and writer in Chinese, winner of 54 gold medals, and named by the USA Wushu-Kungfu Federation to its Hall of Fame as both “Internal Athlete of the Year 2000” and “Coach of the Year 2001.” Siu-Fong Evans runs the JING Institute, and is Jing Jing’s coach. Genetics and coaching aside, Jing Jing’s t’ai chi makes clear why t’ai-chi is a martial art, with emphasis on the art. When she lifts her leg for a left or right heel kick, she holds it as high as a ballerina at the barre, except that the barre is not there to help her balance. When she lowers herself as a snake creeping downward, she slinks impossibly low. Flexibility, balance and balletic grace are supremely controlled. Mastery is complete. I ask Jing Jing which of her interests appeals to her most.